NEW YORK, NY, June 22, 2011 — For the second year in a row, ePromos Promotional Products has made Counselor magazine’s “Best Places to Work List.” ePromos is ranked 33rd on the list of businesses in the advertising specialty and promotional products industry, moving up 32 spots from last year’s list. Counselor magazine is a business-to-business trade magazine published by the Advertising Specialty Institute (ASI). ePromos made the largest climb on the “Best Places to Work List” of companies appearing for a second straight year. Some of the ePromos programs motivating employees to vote it one of the best places to work include: various incentive programs, employee recognition programs, team building events, frequent office parties and social outings. ePromos was the highest ranking distributor with headquarters in New York City to make the list and has employees working remotely in Arizona, Florida, Massachusetts, Minnesota and Oregon. Nominations were selected from more than 250 applicants and the companies making the “Best Places to Work List” were chosen from an employee survey that measured 10 different areas: team effectiveness, retention risk (employee loyalty), alignment with goals (does employee understand goals of company? ), trust with coworkers, individual contribution (does the company adequately recognize employees? ), manager effectiveness, trust in senior leaders, feeling valued (does the company invest in employee success? ), satisfaction with current role, and people practices (satisfaction with company benefits). ASI’s complete list can be found here. Founded in 1998, ePromos is one of the fastest growing promotional products distributors in the world and an eleven-time winner of the Promotional Products Association International’s Web Award. ePromos offers more than 15,000 promotional products and an expert staff of promotional specialists to help customers grow their businesses with innovated and creative marketing products and campaigns. 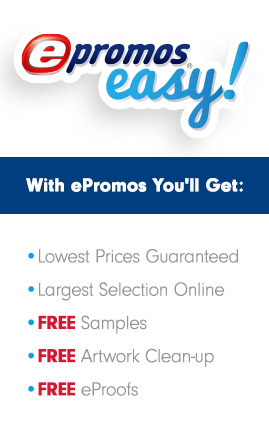 For more information, go to www.epromos.com.